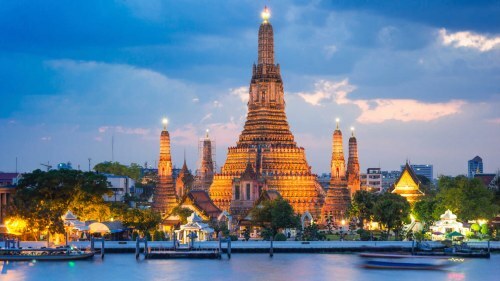 United Airlines and ANA (All Nippon Airways) have dropped the price of their flights from Vancouver to Bangkok, Thailand down to between $514 and $568 CAD roundtrip including taxes. You can also find flights from Victoria (YYJ) or Nanaimo (YCD) for a similar price. A lot of people want to know: "What happens if I just decide to stay in Tokyo, Japan and not go to Bangkok. Can I do that?" Unfortunately all airlines will automatically cancel the remaining flights on your ticket, as soon as you intentionally miss any leg of the journey. What you could do is try looking for one with a long stay in Tokyo, but a really short stay in Bangkok. For example, May 16 to May 28 to May 29 is $622. The flight gets into Bangkok at 11 PM on the Monday, and leaves the next day at around 7 AM. vancouver, yvr, flight deals, victoria, yyj, bangkok, thailand, southeast asia, ana, united airlines, all nippon airways, bkk asia, nanaimo and ycd. 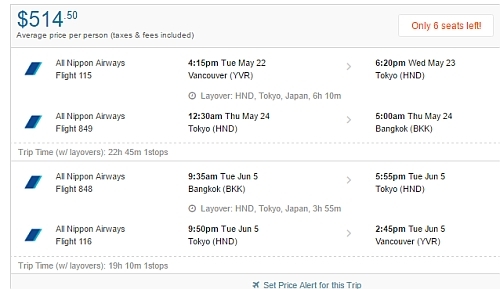 22 Responses to "Vancouver / Victoria to Bangkok, Thailand - $514 to $568 CAD roundtrip including taxes | ANA flights, add Japan for $100"
I was able to book summer round trip from Victoria to Bangkok through Tokyo for only $509.25, the price is incredible, I haven’t seen sach low price even for Tokyo before. No problem Igor, have a great time! Great deal. I even booked flights YVR, to Tokyo, to Bangkok to Vancouver last week of June to first week of July! $659 all in. Thanks Aida, enjoy your trip! Will it be possible to skip the Bangkok flight, and just Van to Tokyo? "A lot of people want to know: "What happens if I just decide to stay in Tokyo, Japan and not go to Bangkok. Can I do that?"" I’m very grateful to you, Chris, for alerting me to this fantastic deal! I was looking for precisely this opportunity to come my way; when your email arrived I was in the process of accepting a much less superior airline at a much higher price. Booked my family of four on this deal and saved a great deal. You’re the best Chris! Thanks indeed ???????? No problem Scott, glad it helped! I can't believe I went ahead and did it - going to Japan and doing a solo-trip have both been on my bucket list since forever!!! The special is still up! 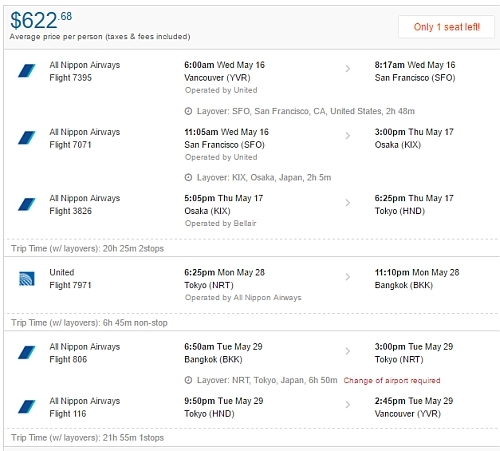 Just booked with ANA (both ways) mid-June to early July, 1 week in Japan, 2 weeks in Thailand for $507 USD which works out to just over $600 CDN! There are still several dates available at this price. What’s the best way to book a deal like this or other deals for 6 people. When I change the passenger amount to 6 or even 3 the prices jumps dramatically. Price is still there use momodo. Have people booked on gotogate before? did some research and seems questionable would appreciate some people's experience. Thanks Chris! What a great deal. 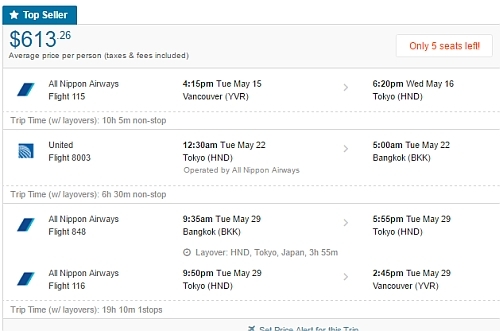 I was able to book a flight from Vancouver to Tokyo and Bangkok for $679 ! No problem Dev, have a great time! Hi priman, these are still around for April, May and June dates. I've added an update to the blog post to help you find them. Warning to those who want to book with the FlightHub, at the end of the booking process you will be offered Extended Cancellation Insurance $39.98, BE AWARE that it’s only valid till the midnight of the same day and seems useless to purchase. If you will change your mind later you won’t be able to make any changes without substantial cancellation fee as this insurance does not cover the period after the midnight.